48% decrease in hair in 8 weeks! Eliminate unwanted hair forever; quickly, effectively and with no pain! Removing armpit hair every day is a hassle and can be irritating to the delicate skin in that area. Shaving doesn’t always fully get rid of it and methods like waxing and plucking are eye-wateringly painful! Some people are now opting for laser hair removal, but it’s expensive, painful and can only remove really dark hairs. So what can you do that will banish your armpit hair for good without any of these downsides? This roll-on combines a deodorant with the unique Episiva hair inhibitor cream formula that will gradually stop hair from growing back. It’s a wonder that nobody has thought of such a great combination before, but Episiva have mastered it! It works by using bio-enzymatic compounds that block nutrients from reaching the papilla cells at the bottom of your hair follicles. The papilla are responsible for hair growth, so when they stop receiving the proteins, vitamins and minerals they need it stops your hair from growing any more. Episiva can be applied anywhere on the body and stops even pale hairs from growing back. 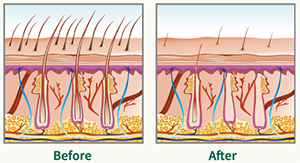 Clinical trials showed a 48% decrease in the number of hairs over 8 weeks, with a 36% decrease in the speed of hair growth. The participants found that they could reduce the amount of hair removal they did by 60%. It’s so convenient to use; just apply instead of your normal deodorant and you’ll be hair and odour-free all day. Episiva hair minimising deodorant has also been dermatologically tested and is safe to use on sensitive skin.